People say all good things come to an end, especially after CAC canceled Spring Kick-Off, but I say bad things do, too. Just last week, the huge pimples that grew on my forehead and stayed for the whole week disappeared into oblivion, and I didn’t have to go through my last Easter in Goshen looking like an egg. My time in Goshen is sadly coming to an end in a month, and it has made me realize what a great ride it has been! Not like one of those 2 a.m. rides to McDonald’s on weekends after constant springs of great conversations, but like one of those bike rides through picturesque parts of Europe with your close friends. I still remember applying to Goshen College as a transfer, completely unsure of what I was getting myself into. Thankfully, Jill Koop Liechty was my admissions counselor, and we connected very easily through our mutual love for Bollywood and Kal Ho Na Ho (the movie that I guarantee will make you cry even more than those 8 a.m.s, mandatory chapel requirements and the food the Rott has on Friday night). I remember not knowing anyone and having doubts about my decision to come here while I sat in my room at Kulp, which felt like a sauna without a fan. But three years later, everything is where it’s supposed to be—except Java Junction, which is still too far and too inside the dorms for the commuter students. I would say that I have grown to love Goshen, but that would also be a lie because I have slapped myself for coming here during all my winters here while walking half-asleep like a zombie to Newcomer at 9 in the morning and freezing all my nose hair on the way there. Goshen is, and always will be a huge part of my life. I have grown a lot here, but not like Ben Meyer Reimer. I have been 5’7 since 10th grade. I have grown as a person, as a #globalcitizen, which I obviously am, as my DNA has labeled me as an Indian/British/Finnish/Afghani just a few months ago and as a compassionate peacemaker. I probably got all that wisdom from the old people from College Mennonite Church who I was BFFs with during my first semester here since I did not know any students, and was too busy being a math major and having two classes with David Housman to make friends at all. But we all know how welcoming Goshen is, and eventually, I made friends my age as well, but I have to admit that none of them are nearly as cool as my BFFs from the church. No one can ever be as #couplegoals as Russ and Marge Liechty, #toocoolforschool as Bill and Phyllis Miller and #funnierthansoggymemes as Vic Stoltzfus, who also runs a church group that sponsors awesome, beautiful and funny international students to come to Goshen. But as I was saying, I have grown a lot here. And I would obviously like to thank the Rott for that as well. I think working at the Rott for my first few months really sped up my aging and killed my youth. I am glad I worked there during my first year when I had a lot of patience and love. If it was now, I would probably be serving some of you burnt pizzas and uncooked fries. Especially those of you who confuse me for Sohail, Aritha or even Deeksha. You have no idea what level of atrocity you commit when you do that! But also, sadly, my own parents thought I was Deeksha when they watched the Coffeehouse video. As I was saying, Goshen has been nothing less than amazing. From changing my major from math to accounting to meeting one of the best professors I have ever had in my life (shout out to the dabbing, the dancing, the wrestling, the Kendrick Lamar music-playing, prank emails-admiring, accounting genius and emoji king Andrew Hartzler). Goshen has been a great journey. I have made great connections and great friends. I don’t want to brag, but I am also best friends with Jo-Ann Brant, Dr. Mitch, Chad Coleman and Bob Yoder on Facebook. In fact, I once had picture of Chad Coleman as my profile picture on Facebook with him tagged. We’re that close. Or maybe I just left my laptop unlocked at Java. One moment, you are leading coffee club, ISC and Senate and socializing with the whole school, the next you just spend in an off-campus housing basement, away from the rest of the campus, watching “This is Us” with your friends, crying and trying to figure out who you’d be if you and your friends were in the show. 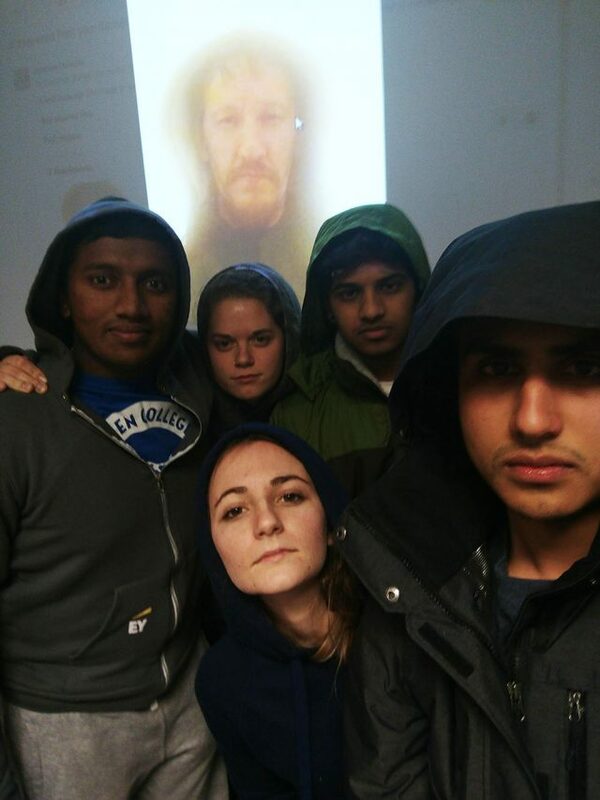 It took us the whole semester to figure that out but with unanimity, we decided that I would be Jack, the kind, caring lead; Phil Chan would be Toby, the funny, kind guy; Kethayun Mehta would be Beth, the ferocious boss lady; Caleb Liechty would be Kevin, the most good-looking one of the family, and Sohail Das would be Miguel, the one who we’re not sure if he’s protagonist or antagonist yet. Also, I still remember my first Coffeehouse performance, I was terrified to take center stage because I was so shy. And by my last Coffeehouse, I was fighting to the death for that very spotlight. The only thing that remained constant in that journey was Tabitha Immanuel and Deeksha Pagar trying to not jump off the Rec-Fitness Center while trying to teach me how to dance, which I’m sure Scott Hochstetler will relate to as well as he tried to teach me how to sing. I am leaving Goshen, but I am also taking these moments with me. Nervous laughing at Skip’s bad dad jokes and pretending to enjoy his burnt popcorn, nearly killing Chelsea Risser and myself while she was trying to teach me how to drive (if you see me driving around, I still suggest you run for your life), blowing corns during Coffeehouse food prep and getting kicked out of the kitchen, promising Dona Park that I will run with her every morning at 6 at the Rec-Fit and not showing up ever, being late to 9, 10, 11 and even 3 p.m. classes, working at 7 different departments and mixing your schedule, working at Java and hearing all the juicy gossips for free, writing funnies with Isaac Longenecker and getting affirmation from Abby King that I am actually funny, meeting at Newcomer with my accounting study group to study for tests but just arguing with each other till 3 in the morning about every little thing. These small moments have played such a big part in my GC experience. I don’t know what the future holds, but I just want to take these moments and be happy. These moments will always put a smile on my face, might even make me laugh a lot, but probably not as much as “Pirates of Penzance” made Achieng Agutu laugh during the Saturday night show. That was some another-level hysteria that will echo in Umble for years to come.